Amechanical seal has failed, and the pump must be taken offline. The consequences could range from a minor inconvenience to a complete unit shutdown. The reliability of that pump and possibly the entire system has decreased. So, what happened? Some clues may be gained by examining the seal components, but finding a true root cause is unlikely without knowing the conditions surrounding the seal leading up to the failure. Consider for a moment that passenger aircraft, trains, merchant ships and (eventually) cars are required by law to have onboard data recorders (ODRs) that produce alarms, perform system checks and provide evidence for incident investigations. Aircraft ODRs must record 91 types of data, trains 25, merchant ships 25 and cars 15 (for vehicles that have ODRs). Of course, comparing a single mechanical seal in a small water pump to an Airbus A321 traveling at 500 mph or a 10,000 ton freight train rolling through Chicago might be a stretch. But certainly the user can think of several pumping applications where a seal failure could threaten the safety of plant personnel, cause significant damage to the pump and other equipment, or result in significant economic costs. If we place all of these concerns under the heading of reliability, then the transportation industry says that knowledge is a major component of reliability: real-time, all-the-time, automatically recorded knowledge. An investment in piping plan instrumentation can increase real-time knowledge and plant dependability. The more the piping plan instrumentation acts like an ODR, the more reliable the system will be. 1. 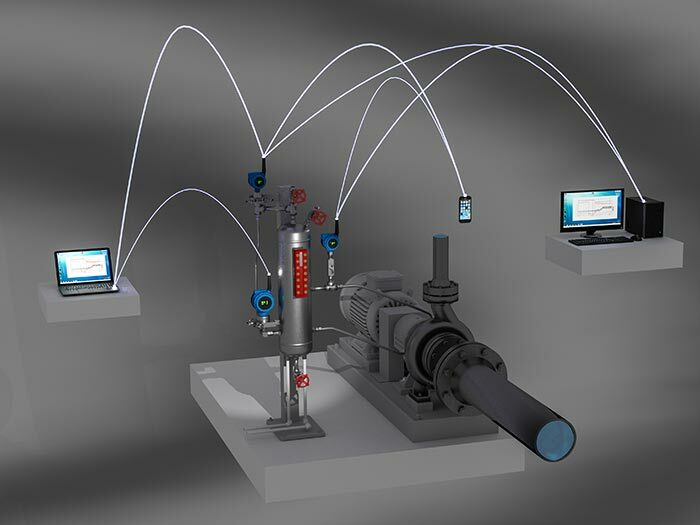 Many large process plants and pipeline networks record data from electronic transmitters that detect mechanical seal piping plan parameters such as pressure, temperature, flow and level. This data is routed to the supervisory control and data acquisition system (SCADA) where operations, maintenance and reliability teams can respond to alarms and plan future maintenance before an expensive seal failure happens. Alarm levels can be changed remotely, whereas analog switches must be changed manually inside the switch housing. 2. Plant reliability engineers can review historical plots of SCADA data when troubleshooting bad actor installations (see Image 1). The data streams from the seal support system transmitters can be overlaid with pumping variables such as suction pressure, process flow, pumpage temperature, shaft speed, vibration, motor current and even weather conditions. In many cases the onset (not the cause) of seal leakage can be correlated to some trend, event or step change in one or more of these pumping parameters. 3. The instruments collect data constantly, 24 hours a day, seven days a week. This is particularly important for pipeline pumps in unmanned stations for obvious reasons. For process units, recording constant data remotely reduces the time technicians must spend at each pump writing down readings from analog gauges. 4. Modern SCADA systems do not require an engineer or technician to sit in the control room bothering operators to pull up different instrument readings. Secure networks allow authorized users to access the data from anywhere at any time. They can also meet with the pump OEM and seal vendor to review data together, without bringing everyone into the plant. 5. Wireless transmitters are widely available so that external power and instrumentation cabling is not required. This reduces the cost of installing transmitters on existing piping plan installations and allows future bridging to the internet of things (IoT). A conceptual image is shown in Image 2. 6. In 2014, the fourth edition of API Standard 682 made electronic transmitters a requirement in at least 10 of the piping plans described in Appendix G. The language in paragraph 9.5.1.1 is precise: “Unless otherwise specified, each alarmed variable shall be furnished with one indicating transmitter located to facilitate inspection and maintenance.” The end users in the API 682 task force were the primary drivers of this requirement based on the best practices at their facilities. 7. Most switches do not have onboard diagnostics like transmitters, so they must be checked periodically to verify proper function. The time required to do this can add up quickly. 8. Buffer and barrier fluid levels—and the rates of change of those levels—are some of the most critical pieces of data for dual liquid seals. An ultrasonic level switch only alarms when the liquid level activates the sensing element, whereas a level transmitter displays and records the actual liquid level. This means a single level transmitter can replace two level switches if both high and low level alarms are desired. Because of advances in technology, now is a good time to consider upgrades to the seal piping plans at the end user level. Global end users are implementing pump systems optimization (PSO) programs, and an upgrade to the existing piping plan systems fits neatly into the financial payback analysis. Start to think of a piping plan as an onboard data recorder that allows personnel to use the data in the best way to improve reliability. 14 CFR 121.344 91 types of data for passenger aircraft. 49 CFR 229.135 25 types of data for freight trains. 49 CFR 563 15 types of data for cars. International Maritime Association, Resolution MSC.333(90) Adoption Of Revised Performance Standards for Shipborne Voyage Data Recorders (VDR). 20 parameters. “Beyond Switches for Pump Monitoring: What Changed with API Standard 682,” white paper, Emerson Process Management, Copyright Rosemount Inc., July 2015. John Merrill is principal engineer at EagleBurgmann. Gabriel Young is senior field engineer at EagleBurgmann. For more information, visit www.eagleburgmann.com.